Today, India finds itself going through a phase of rapid ascent in economic empowerment. Industries are evolving at a significantly higher rate since liberalisation. Our focus for this decade will be on the development of key infrastructure and the uplifting of the 600,000 villages where 750 million people live, as vibrant engines of the economy. In 2008, we crossed the trillion-dollar mark, and it took more than six decades for us to reach that milestone. However, it is predicted that the Indian economy will double again, to reach the $2-trillion mark by 2016, and then again redouble, to reach the $4 trillion milestone by 2025v. All this economic growth will need massive energy. It is predicted that the total electricity demand will grow from the current 150,000 MW to at least over 950,000 MW by the year 2030vi — which will still be less than one-fourth of the current U.S. per capita energy need. 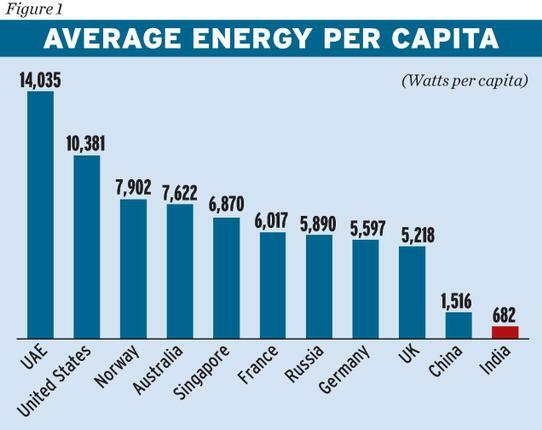 In fact, by 2050, in all likelihood the demand could go even higher, and the per capita energy demand would be equal to the current French or Russian figure of about 6000 W per capita. So, will we allow an accident in Japan, in a 40-year-old reactor at Fukushima, arising out of extreme natural stresses, to derail our dreams to be an economically developed nation? When a few European countries, particularly Germany, decide to phase out nuclear power, that should not become a blanket argument to take a view against our nuclear programme. A few things need to be put in context here. The decision of Germany suits its current scenario which goes beyond mere concerns of risk posed by nuclear power. Germany is a developed nation, a power-surplus nation — so it can afford to lose a few plants. More important, Germany has completely exhausted its nuclear resources. Against a total demand of 3,332 tonnes (2006-08)vii it was able to produce only 68 tonnes (Note: This was the production in 2006) of Uranium, and for the deficit it was relying on importsviii. Thus, nuclear energy never fits into its goal of energy independence. India, on the other hand, is the leader of the new resource of nuclear fuel called Thorium, which is considered to be the nuclear fuel of the future. 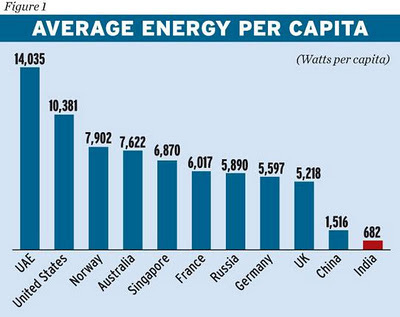 which shows what share of energy these advanced nations are generating by means of nuclear power. 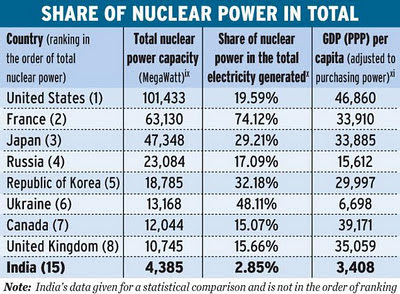 The study indicates that most of the prosperous nations are extracting about 30-40 per cent of power from nuclear power and it constitutes a significant part of their clean energy portfolio, reducing the burden of combating climate change and the health hazards associated with pollution. 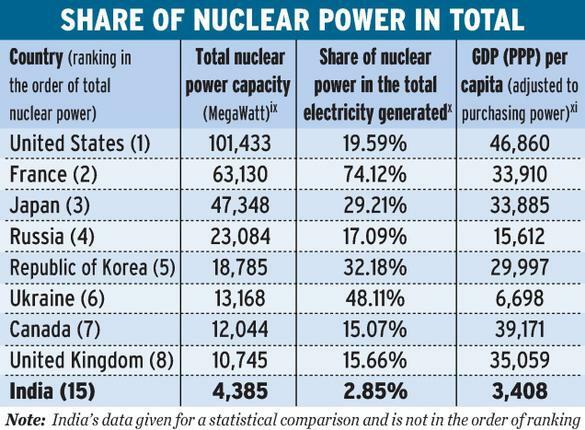 Meanwhile in India, we are not generating even 5000 MW of nuclear power from the total of about 150 GW of electricity generation, most of it coming from coal. We should be careful not to be carried away by the barrage of anti-nuclear news often being generated by many of the same nations that are enjoying the maximum benefits from it. The economically developed world has a well-trained habit of presenting their success in a distorted context to misguide emerging nations like India, which are a potential challenge to their neo-age proxy-imperial economic subjugation. What is needed for our India, we Indians have to decide. Hence, we and we alone will decide what is the best needed action for our economic prosperity, based on our context and resource profile. 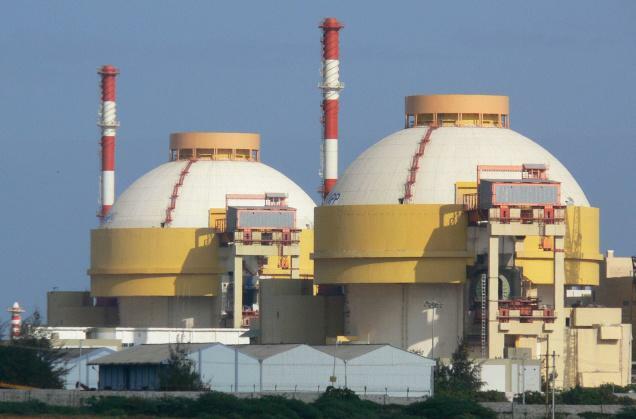 India is blessed with the rare, and very important, nuclear fuel of the future – Thorium. We cannot afford to lose the opportunity to emerge as the energy capital of the world, which coupled with the largest youth power, will be our answer to emerge as the leading economy of the world. India has the potential to be the first nation to realise the dream of a fossil fuel-free nation, which will also relieve the nation of about $100 billion annually which we spend in importing petroleum and coal. Besides the billions spent on importing coal or oil, we are also importing millions of tonnes of CO2 and other greenhouse gases, which are a hazard to the environment and human health. 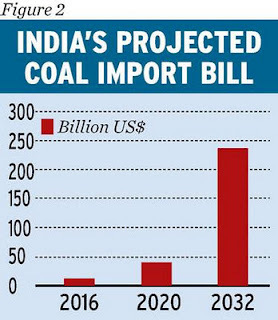 It is noteworthy that in 2010-11, India imported about 82 billion tonnes of coalxii, a large fraction of which was for the thermal power plants. Experts believe that this number will continue to rise exponentially in the times ahead, as shown in Figure 3xiii. Much of the destructive power of nuclear accidents is compared against the benchmarks of the atomic bombing of Japan by the U.S. forces during the Second World War. Pictures of mushroom clouds looming over cities, charred buildings, and massive death scenes are awakened to form our opinion of nuclear dangers and disasters. But that is far from the reality. It is poor judgment and a deliberate act of spreading fear to compare a nuclear bomb with a nuclear plant. The bomb is designed to deliver a large amount of energy over a very short period of time, leading to explosions, firestorms and massive heat energy generated to obliterate every object in its path. That is what a bomb is supposed to do! Civilian nuclear applications in the form of a power plant, on the other hand, are designed to deliver small amounts of energy in a sustainable manner over a far larger time frame. 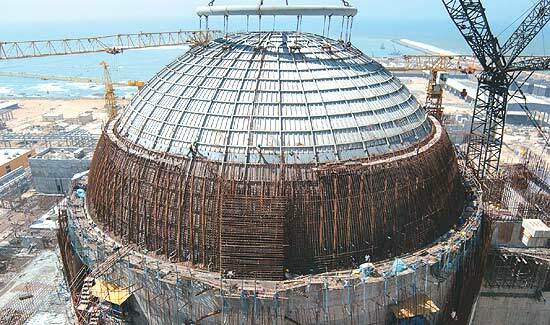 It is designed with systems to control and cool the nuclear reaction. There are safety procedures and back-ups, and even in the event of failures, as in the 2011 disaster, the destructive might will never be even a fraction of what happens in the case of a nuclear bomb. We need to put the Fukushima-Daiichi events in the historic frame of nuclear accidents and analyse them. While there was huge loss to property and disruption of normal life, there was no direct loss of life due to the accident or during the operation in its aftermath to contain it. As a silver lining, the way the accident was handled — compared to the Chernobyl disaster of 1986 — showed how much progress we have achieved in nuclear emergency management over a period of two and half decades. The Fukushima-Daiichi plant was almost five times as big in terms of power generation and, more significantly, contained about nine times the nuclear fuel at the time of the accident. Yet, with better emergency management learnt over the years, the maximum radiation was less than 0.4 per cent of that released during the Chernobyl disaster. So, while the Fukushima-Daiichi accident was unfortunate and needs review, one must also acknowledge the advancement of national and international capabilities to manage nuclear emergencies now. Another argument which surrounds the nuclear debate is that nuclear accidents and the radiation fallout as the aftermath would not only harm the exposed generation but also continue to impact generations to come. If available facts and scientific inquiry was given more weightage than mere conjectures and comic-bookish imagination, this argument will in all probability be proved a myth. The strongest case of human exposure and destruction due to radiation is, without argument, the Hiroshima and Nagasaki nuclear bombings of 1945. These are the only two occasions when nuclear force was intentionally developed and deployed to kill human life. Post the bombing, the U.S. government established the Atomic Bombing Casualty Commission (ABCC) in 1946 to assess the late-effects of radiation among the atomic bomb survivors of Hiroshima and Nagasaki. It operated for 30 years until, in 1974, it was reconstituted as a joint venture between the U.S. and Japan under the name of Radiation Effects Research Foundation (RERF). It is operational even today. The ABCC and the RERF have extensively studied the long-term impact of radiation and nuclear disaster across generations for over six decades now, and the findings throw light on the possible effects of radiation. Its report says that chronic (sustained) exposure of about 100 millisieverts (mSv, which is the international unit to measure radiation), increases cancer risk by 0.5 per cent to 0.7 per cent. Notably, the areas in close proximity of Fukushima had a peak exposure of 800 mSvxiv. Of course, there is some correlation between radiation exposure and cancer risk, which must be acknowledged. But the notable aspect is that, contrary to popular belief, the findings clearly state that the effect of such exposure is limited only to the exposed generation. To quote the report, “Our studies have not found thus far any inherited genetic effects from parental radiation exposure among the children of A-bomb survivors.”xv (Note: A-bomb stands for the atom bomb. Two atomic bombs were dropped by the U.S. on the Japanese cities of Hiroshima and Nagasaki on August 6 and 9, 1945, as part of the Second World War.) Thus, while radiation due to a nuclear disaster is dangerous, it would amount to wrong propaganda to state that nuclear disasters will affect generations to come. Of course, the technology has been advancing over the decades and the human capability to contain nuclear disasters has definitely advanced. There is no doubt that nuclear power is superior along three dimensions, namely, energy density, effect on improved quality of living, and the economic benefits. Now let us look at the key challenges which pertain to the sector, especially in the wake of the recent natural disaster impacting the Daiichi plant in Fukushima. Two concerns are prominent here. The first is that of safety against the plant's disaster, and the second relates to the environmental impact and the nuclear waste which the plant generates. Let us consider the second issue first. a) Abstinence from nuclear power is an incomplete response without the logical alternative. If we look at the complete picture of alternative measures, we will have to endorse the fact that our current and future energy demands have to be met. In economics, there is a concept called “opportunity cost,” which refers to the cost incurred when one chooses the next alternative. So what happens if we pronounce a total ban on nuclear energy generation? Some part of the future need, although only a small fraction, would come from solar and wind sources, with great unpredictability as pointed out earlier. A part would be offset by hydro-power too. But in all probability we will continue to increase our reliance on fossil-based fuel power generation methods, at least in the near and mid-term future. And that is where the problem lies. Every year, human activities are adding about 30 billion tonnes of CO2 xvi into the atmosphere. The IPCC estimates that 26 per cent of this emission (about 7.6 billion tonnes) is a direct consequence of electricity generation requirements. This is not really air pollution but it adds to the risk of climate change, which is exhibited in changing rainfall patterns, sea levels and temperatures, leading to food shortages, malnutrition, and disease alterations. The WHO estimates that about 1.3 million peoplexvii lose their lives as a result of urban outdoor air pollution alone, and about 140,000 are causalities to adaptation challenges of climate changexviii. (Note: Additionally, about two million lives are lost due to indoor pollution, the primary victims being women, and children under the age of five.) Thus, the pollution caused by power generation activities, and the climate change associated with them, are directly or indirectly responsible for about 481,000 deaths every year. Comparatively, in the case of the worst civilian nuclear disaster ever at Chernobyl, the United Nations Scientific Committee on the Effects of Atomic radiation (UNSCEAR) predicted up to 4,000 cancerxix cases (often curable) due to the accident, besides 57 direct causalities. Unclean fossil energy is definitely not sustainable in the future. Moreover, fossil-based fuels are fast depleting, and their scarcity is inspiring geopolitical instabilities around the world. Furthermore, it is believed that the changing climate patterns will carry a costly adaptation price tag in the future — an enormous $300 billion every year, which will be a huge drain on the global GDPxx. All these issues can be addressed only when we graduate from Type-0 fuels to the next-generation fuels — the most prominent amongst them being nuclear fuels, which will also power our deep space missions of the future. 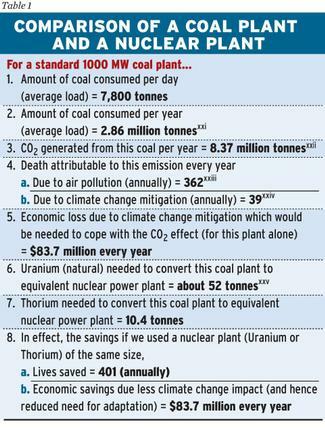 A standard approximate comparison between a 1000-MW coal plant and a similar nuclear plant is given in Table 6.
b) Now, let us delve more into the other issue — that of plant safety. Throughout the history of nuclear power generation there have been four major incidents of plant failure — the Kyshtym accident in fuel reprocessing in 1957, the relatively smaller Three Mile Island meltdown (United States), the much bigger Chernobyl accident (USSR, 1986) and the recent Japanese incident at Fukushima. The first accident was purely due to underdeveloped technology, and much of the blame for the next two disasters is attributed to human error. Even in the case of the Fukushima disaster of 2011, there were extraordinary natural forces in action — the rare occurrence of the tremendous stress load of an earthquake coupled with the unprecedented shear load of a tsunami. Of course, there is a need for better technology and more stable plant design across the world, but the occurrence of four failures in six decades cannot be made out as a case for completely disbanding the technology — which is one of our foremost keys to graduating beyond the fossil fuel-based low-end energy. The best of technological progress, while being the biggest ally of mankind, does come at an incremental risk. The key is to learn and evolve to mitigate the risk, rather than use the first incident as an excuse to disband science. Let us take a few examples. In 1903, the Wright brothers translated into reality the remarkable dream of controlled human flight. Not more than half a decade later, in 1908, the first flight disaster occurred, which severely injured Orville Wright and killed his co-passenger. Many accidents followed, and even today air accidents kill more than 1,500 people every year. Imagine whether we would be flying between distant cities, across oceans and continents, if the incident of 1908, or the ones later, were used as a reason to disband human flight? When the mighty ship Titanic set sail in 1912, it was heralded as the pioneering mission in the field of large and comfortable ocean liners. But on its first voyage it struck an iceberg and sank, killing more than 1,500 people, more than two-thirds of those on board. But that never stopped our quest for bigger and faster means of ocean travel. The very first attempt to send man to the moon, Apollo-1, met with an accident and killed three prominent astronauts. It took another 10 missions, with mixed results, before Apollo-11 finally made it to the moon in 1969, with Neil Armstrong setting foot on the lunar surface and declaring to the world those never-to-be-forgotten words: “One small step for man, one giant leap for mankind.” Indeed, that small step was preceded by many a stumble. The Indian space programme, which is now ranked among the best in the world, started with a failure in 1979 when our first rocket, instead of putting the satellite into a near-earth orbit, went into the Bay of Bengal. 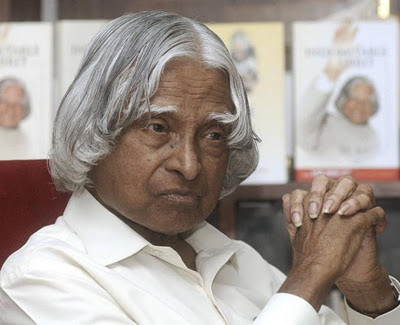 I was the Mission Director of the launch, and we were accused of putting a few crores of rupees into the sea. We did not wind up our dreams with that one accident and the criticism. The mission continued and the next year we were successful. Today, that programme, which started with a failure, is the first and only one to discover the presence of water on the moon with its Chandrayan mission, and is now a pride of the nation. The argument is, of course, that all failures and accidents propel us to think and develop better and safer technologies towards better service. And in the case of nuclear power, we do acknowledge that the effects of radiation can reach a wider impact zone. But then, improvement, and not escapism, should be our step forward. Let us introduce a lesser-known member among radioactive materials — Thorium. It is perhaps the best solution possible in the future and would be technologically and commercially the best option in another two decades. Thorium, the 90th element in the Periodic Table, is slightly lighter than Uranium. Thorium is far more abundant, by about four timesxxvi, than the traditional nuclear fuel, Uranium, and occurs in a far purer form, too. It is believed that the amount of energy contained in the Thorium reserves on earth is more than the combined total energy that is left in petroleum, coal, other fossil fuels and Uranium, all put together. 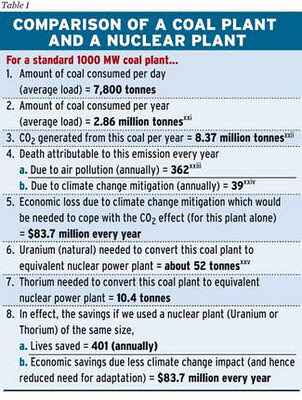 And information revealed in an IAEA Report (2005) on Thorium fuels indicates that India might have the largest reserves of Thorium in the world, with over 650,000 tonnes. (Note: The IAEA, the International Atomic Energy Agency, is the world's centre of cooperation in the nuclear field. It was set up in 1957 as the world's ‘Atoms for Peace' organisation within the U.N. family.) This is more than one-fourth of the total deposits of Thorium; in comparison, we have barely 1 per cent of the world's Uranium deposits, which is currently being put to effective use, our having opted for the closed fuel cycle technology. 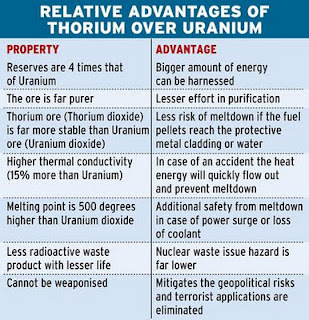 Thorium has many other advantages. It is estimated that Thorium may be able to generate (through Uranium-233 that could be produced from it) eight times the amount of energy per unit mass compared to (natural) Uraniumxxvii. 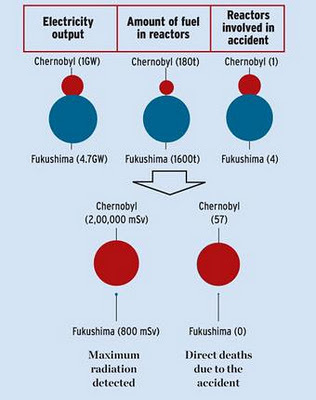 In the much debated issue of waste generation also, Thorium has a relative advantage. It produces waste that is relatively less toxic due to the absence of minor actinides (that are associated with Uranium). At the same time, it is acknowledged that the long-lived high-level waste from Uranium, especially in light of the Indian strategy of adopting the closed fuel cycle involving reprocessing for the recovery of Plutonium and Uranium, can be effectively managed using technologies available today. 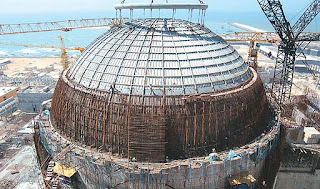 Indian nuclear experts tell us that the relatively small volumes of such waste (long-term storage space of less than a quarter of the size of a football field is adequate for the estimated waste from a 1000 MWe plant) can be safely stored after vitrification for hundreds of years without causing any risk to the environment or the people. One question that crops up is, why then has Uranium rather than Thorium become the popular choice for nuclear energy programmes across the world? There are two reasons: one is technological and the other is historical. The technological reason stems from the simple fact that at first one needs to produce Uranium-233 from Thorium, and for this, reactors based on the naturally available nuclear fuel material, Uranium-235, are required. In addition, the recovery of Uranium-233 by large-scale reprocessing of irradiated thorium, as well as the likely presence of hard gamma emitting Uranium-232, pose certain practical hurdles. But according to experts, all these can be overcome technologically. The second and the historical reason why Thorium has lagged behind in the ladder of development, comes from its advantage of being able to provide Thorium-based fuel, as seen from the context of the relatively unstable geopolitical conditions — which is that Thorium cannot be weaponised. Unlike Uranium, which is always on a tight-rope walk between being a power source and finding destructive applications, Thorium bombs just cannot be made. Here history steps in. It must be remembered that much of the current civil nuclear applications are direct offshoots of the military nuclear technologies of the Cold War period. 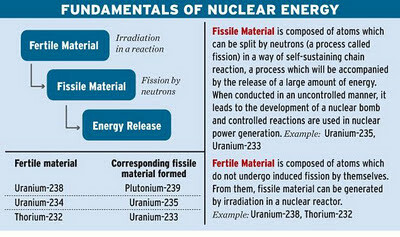 So, the first significant outcome of nuclear technology was the Manhattan Project during the Second World War, which ultimately culminated in the Hiroshima and Nagasaki bombing of 1945 by the U.S.
A nuclear weapon is different from a nuclear plant, as in the former there is no need to control or slow down the reactions that lead to a catastrophic energy release in a short time interval — which is the essence of a bomb. However, a nuclear plant needs moderation of the reaction to sustain a steady but controlled release of energy. It was only by the end of 1951 that some noteworthy work was done in controlled nuclear power generation at the EBR-1 experiment in Idaho to produce 100 KW of nuclear power. This “weapon first” approach to nuclear technology led to the fact that there was little focus on developing methods to energise from Thorium, which is non-weaponisable, and a larger focus on Uranium, which can be weaponised. 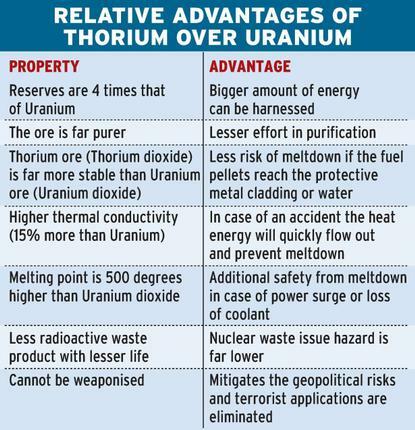 But now, being the largest owner of Thorium, and also being amongst the nations which will see the highest surge in power demand with its growth, the opportunity is for India to pursue its existing nuclear programme with a special focus on research and development on the Thorium route as the long term sustainable option, which we are already undertaking. For this purpose, it is imperative to continue to implement the current Indian plan of making use of the uranium and plutonium-based fuel cycle technologies as well as irradiate larger amounts of Thorium in fast reactors to breed Uranium-233 fuel as it graduates to the Thorium-based plants. It is noteworthy that the Indian plan for an advanced heavy water reactor (AHWR) is an important step to launch early commencement of Thorium utilisation in India, while considerable further efforts to use Thorium in both thermal and fast reactors would be essential to harness sustainable energy from Thorium-generated Uranium-233. Various technologies for Thorium-based plants are already being developed and deployed on a test basis across the world including in India, which have a promising future. These include first breeding it to fissile Uranium-233 isotope in the conventional reactors or through the revived interest in technologies like the Molten Salt Reactors (MSR) which use salts to trap the fissile material and do not react with air or burn in air or water. In this technology, the operational pressure is near the ordinary atmospheric pressure, and hence the cost of construction is low and there is no risk of a pressure explosionxxviii. A significantly large quantity of highly active nuclear material exists, and will continue to exist in the form of nuclear armaments — which was the mother programme of the nuclear energy programme. In 2010, there were about 22,000 nuclear warheads spanning at least nine countries of the world, and 8,000xxix of them are in active state, carrying a risk far greater than controlled nuclear power reactors. If the argument of risk is to be used to eliminate the peaceful energy generation programme, then the nuclear opposition factions must first direct their efforts at Washington and Moscow, the owners of 90 per cent of the world's nuclear warheads, to disband their nuclear arsenal — which is, by design, intended to be hostile. Would that happen? Unlikely, at least in the foreseeable future. Our aim should be to minimise the risks associated with nuclear power. The power of the nucleus is mighty and the future of humanity lies in harnessing it in a safe and efficient manner. In the years to come, it will fuel not only our earth-based needs but also our space missions and perhaps even our civilisation's reach to other planets for habitation. Our current nuclear projects will expand into better and safer materials, like Thorium, and later on, into better reactions like fusion, which once completely developed, will be able to generate hundreds of times more of power than current fission methods. Affordable, clean and abundant energy provided by nuclear sources is our gateway to a future that is healthy, learned and connected — a future that will span deep into space and crosses the boundaries of current human imagination. The Jharia coalfields in Jharkhand constitute the richest coal-bearing area in the country: they contain large quantities of high-grade coking coal. But the presence of this natural resource has been a curse for the local tribal villagers. The Jharia area also has a large number of ongoing mine fires, which have a history of more than a century and have been causing great loss to life and property. I am reminded of an incident that happened when I was President of India. I was travelling from Sindri to Dhanbad. Hundreds of villagers rushed to my car. We immediately stopped and listened to them. They narrated the heating and spot-fire which regularly take place near their houses. A major challenge to the mining community is that of tackling fires, which have engulfed large and densely populated coal-bearing areas. I and my team visited their houses, where we discovered intense, unbearable heat, emanating not from the skies but the ground below. Occasionally, jets of flames would spurt out from the ground, scorching the earth. The entire area has been destroyed by the mining activity and rendered uninhabitable for humans or any other life form. Sadly, it can never be restored, at least not for the next million years. Much of the coal mined today is used for electricity generation across the world, and there are many more Jharias being created across the rural and forest lands of earth. These will continue to swell in numbers and size — unless we find sustainable alternative fuel sources to replace fossil fuels. Urban Outdoor Pollution (UOP): It refers to the air pollution experienced by people living in and around urban areas, generally in open space, for example, roads. Indoor Air Pollution (IAP) refers to pollutants found indoors, generally due to inefficient fuel consumption, chemical pollution to building material, and so on. UOP contributes to IAP. Nearly two million lives are lost due to Indoor Air Pollution, the most common victims being women, and children under the age 5.
vii “World Nuclear Power Reactors 2006-08 and Uranium Requirements.” World Nuclear Association. 2008-01-14.
xix “UNSCEAR assessment of the Chernobyl accident.” Unscear.org. xxiii Considering the following calculations. About 30,000 million tons of CO2 is responsible for the casualties of about 1.3 million lives per year. (1 billion ton = 1000 million ton). Thus, 1 MT corresponds to about 43.33 causalities per year. And 8.37 million tons would be responsible (by interpolation) for about 362 lives being lost. xxix “Federation of American Scientists: Status of World Nuclear Forces.” Fas.org. 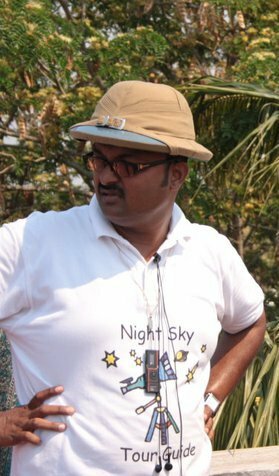 I am very grateful to you for Publishing an article about The Great Astronaut Pathani Samanta.Still Wikipedia dont has an article for Pathani Samanta.I want to create an article and for this could u please help me. Can you mail me with you details as I don't appreciate Anonymous comments or requests!